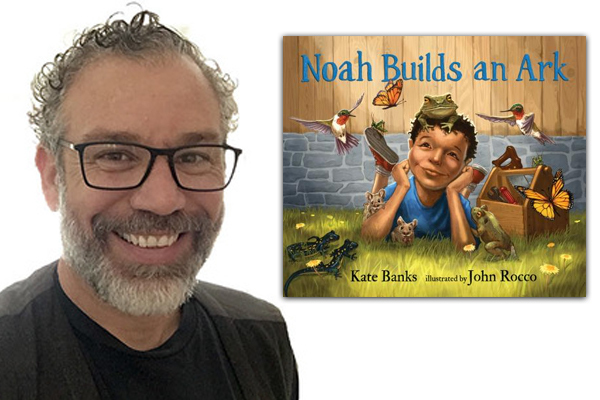 Don’t stress about these April showers because Caldecott honoree John Rocco is coming to read his newest picture book, NOAH BUILDS AN ARK. Inspired by the biblical story of Noah, a young boy prepares for an approaching storm, but not just with his family. He also builds an ark to protect the creatures that live in his backyard! Families of all kinds will enjoy listening to the illustrator reading this sweet tale of a family’s preparation and of a boy’s care for nature. A question and answer session will follow the reading. A storm is coming — a big one. How does a young urban boy prepare? A lovely allegorical story about ecology and caring inspired by the ancient tale of stewardship. John Rocco is the coauthor of the young adult novel SWIM THAT ROCK and the illustrator of many books, including Katherine and John Paterson’s award-winning THE FLINT HEART, of which Bookpage said, “John Rocco’s digitally colored pencil drawings provide a perfect complement, glowing with fairy light.” John Rocco lives in Los Angeles.